On the occasion of Saksham 2019, Petroleum Conservation Research Association (PCRA), under the aegis of Ministry of Petroleum and Natural Gas, has initiated to organize a Short Film Contest through MyGov. 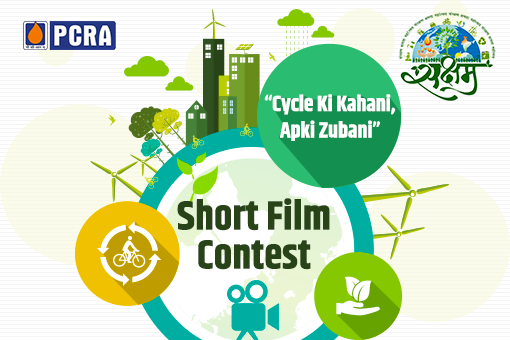 A Short Film Contest invites All Indian Citizens to make Short (maximum 3 minute) Films based on the Benefits of Cycling, Fuel Conservation and Environment Protection relating it to today and the future of India. The objective of the competition is to make the General Public aware of the relevance of fuel conservation, which will help protect the environment for the future generations to come as well as to focus on various benefits of cycling to the environment and the people. 2. Submission of the Short Film will start from 16th January 2019. 3. The duration of the Short Film should be maximum 3 minutes. 4. The Short Film can be made in any of the 22 Official Indian Languages with transcript (in verbatim) in Hindi or English. 5. The winning entries will be announced on a later date on MyGov. 6. The Panel of Jury, who will evaluate the contest, will be Experts on Environment Protection & Fuel Conservation and Film Making. 7. The last date of Submission will be 15th February 2019. 1.The Top successful entries will be awarded by/with Cash Prizes.